Share the floorplan/map of your home, with any points of interest marked and explained further. For the graphically disinclined, a written explanation of the layout would do just as well. Near the Village of Rochefort, are the lands that make up the Château de Rochefort lands which are my husband, Sebastien’s ancestral home.Construction began in 1604, commissioned by Sebastien’s father as a wedding gift for his new bride. I am still unclear as to the exact date of completion of the main house, but I am told that it was expanded multiple times over the years. The approach road stretches for some four or five miles and leads to the Gatehouse. The road winds through the expansive forests that surround the estate as we near the Château de Rochefort itself. Below are some very simplified plans. The originals consist of tens of pages of the various elevations, rooms and details that are rather unnecessary for my purposes here. If you follow me through the Entryway, onto the First Floor. As you come into the vestibule, you see the Grand Staircase. One of my favourite rooms just off the Entrance Hall is the Winter Garden. Of course, we do end up using it the entire year. Certainly when Caroline or Jocelyn were younger and the weather was against their best laid plans, they would play here. 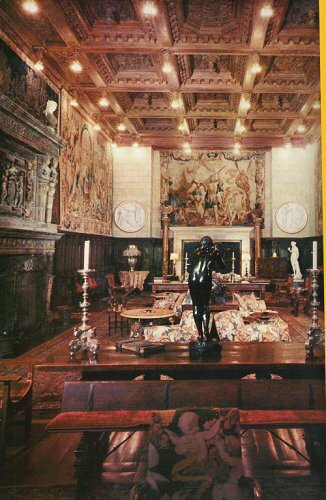 If we turn left and go down through the Tapestry Gallery, we end up in what is probably our favourite room in the Château de Rochefort; the Grand Library. 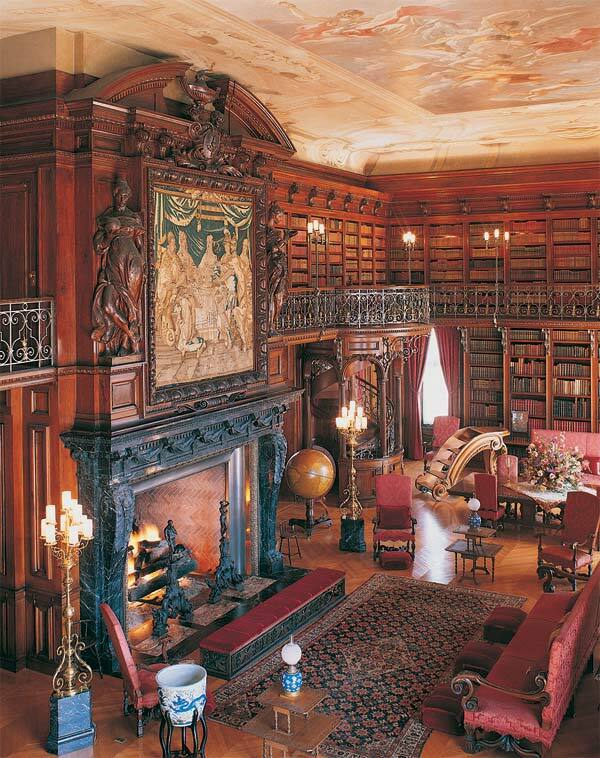 There are other libraries throughout the house, but this one is most special as we have all spent the most time here. Heading back out from the Library, through the Gallery, you can see the Music Room. 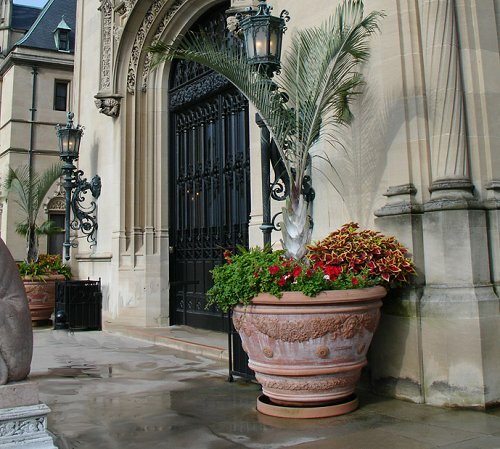 If you go through the elegant arched doorways you can take a look at the Salon. The ceiling treatment is a wool brocade that my Anam Cara, Hsu Danmei, found in the East near his homeland. We thought it would be lovely to do a tented ceiling look in this room. On the wall at each end, you can see tapestries that were given to Sebastien by his Eminence, the First Minister of France, Cardinal Richelieu in honour of my husband’s service to the Cardinal. 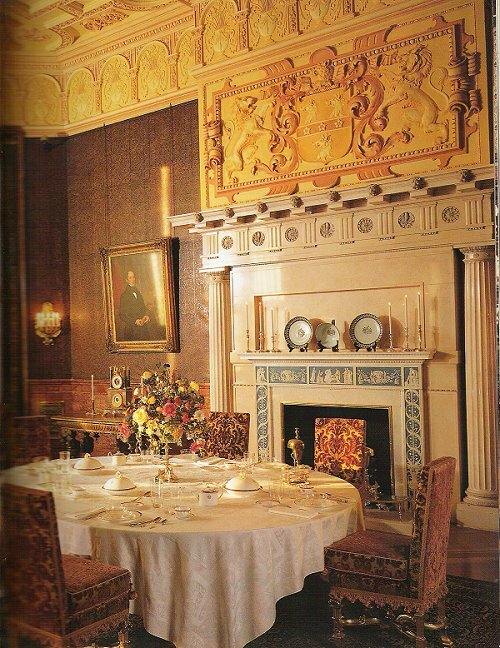 If you follow me, we can go through the smaller of the formal dining rooms, called the Breakfast Room. The light in this room in the early mornings is indeed exquisite, but breakfast is not the only meal that is ever eaten in this room. We tend to enjoy all less formal meals with family and very close friends here. The more formal dining room, the Banquet Hall is something we tend to reserve for very large gatherings, such as our annual Yule celebration when we invite just about everyone we know. 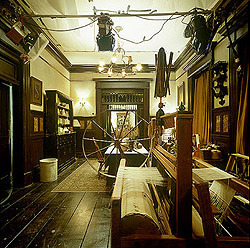 These next rooms of the house, I have to confess, tend to be most frequented by the men. 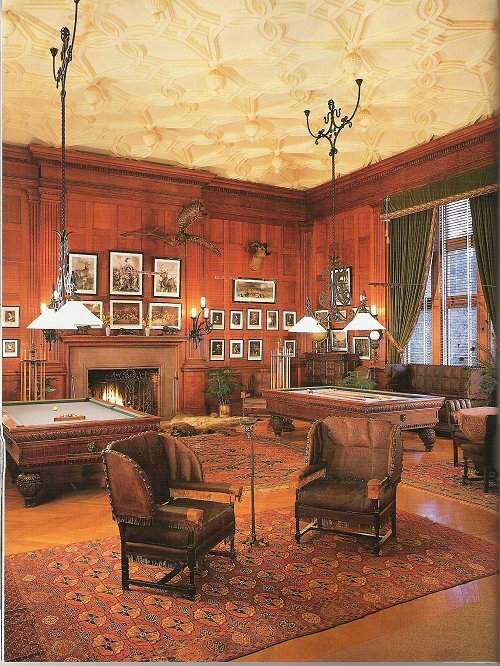 The Billiard Room is usually where you will find Sebastien with Hsu or Marius and other friends shooting a few games of billiards. There is, of course, the Smoking Room. In spite of modern considerations against the habit, the fact is that when the Château de Rochefort was built, tobacco was just starting to get a foothold as a marketable crop in Europe being imported from the New World. Men usually would gather after dinner with brandy or cognac and pipes and would savour conversation and company along with the indulgence of tobacco. We have never changed the name and in the interests of history of the house even though most everyone has gotten out of the habit of smoking. Besides, Sebastien has forbidden it simply because others feel the need for us to be more politically correct. 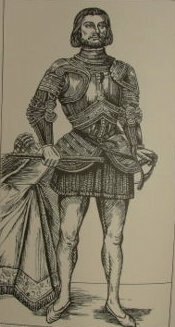 Since Sebastien is doing an inventory of his sword collection, the Gun Room is closed to visitors today. I do apologise. Let us go upstairs to the Second Floor. 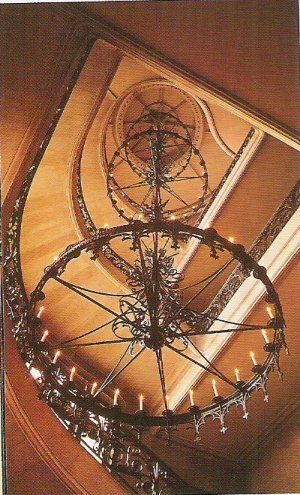 The chandelier array you see here at the stairway are original to the house and are electrified during the middle of the last century. Before that, they would have to be lit by servants each night. Each chandelier has exactly twenty-five sconce, so the amount of candles that we would go through when they were all lit for parties and gatherings for example, back in the day was absolutely astounding. Thank the Goddess we no longer have to go through all of that level of effort and expense. During the Second World War when we were under German Occupation, I do not believe we lit them at all. Now if you follow me upstairs we can take a tour of the upper portions of the house. 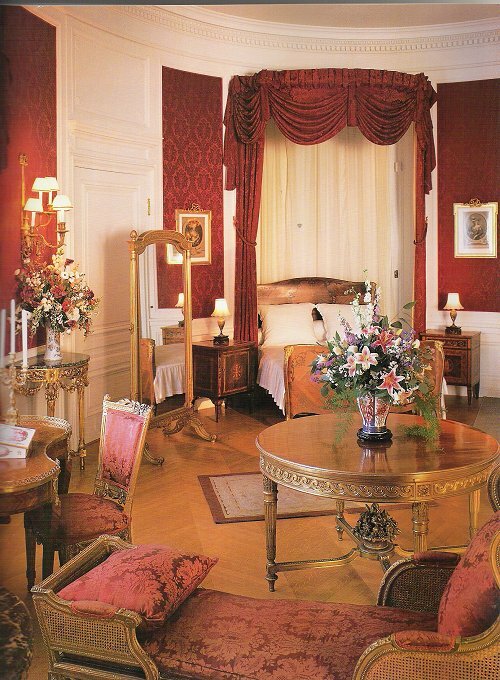 The Louis XVI Room was originally a guest room. However, a certain young Mademoiselle has decided that it is now her room. I cannot say as I blame her. It is very elegant and certainly seems to fit her personality and taste. 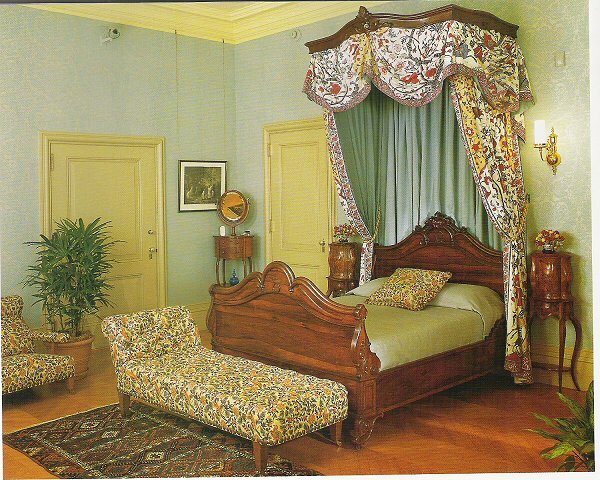 The Chippendale Room serves as Amarante’s boudoir when she stays here at the main house, on the nights she chooses not to stay at the one that she inherited via her family. Second Floor Living Hall is just a very cosy place for family and guests to sit and visit or read when they do not want to go to the main floor. Master Bedroom. This is the one that Monsieur le Comte and I share. I do confess, I did recently redecorate it. I wanted to make use of the sweeping windows. Please excuse the mess. I did not realise that Sebastien had left his laptop and the Wall Street Journal on the floor. I do believe he was checking the Château de Rochefort stock this morning after announcement of our expansion of our operations to the Nappa Valley. Here we have reached the Third Floor. The largest room on this floor by far is the Third Floor Living Hall or Ballroom, and was originally the main ballroom of the house. These days it mostly ends up being the more formal gathering space for family, friends and events, although we do host at least two or three very formal events here every year. 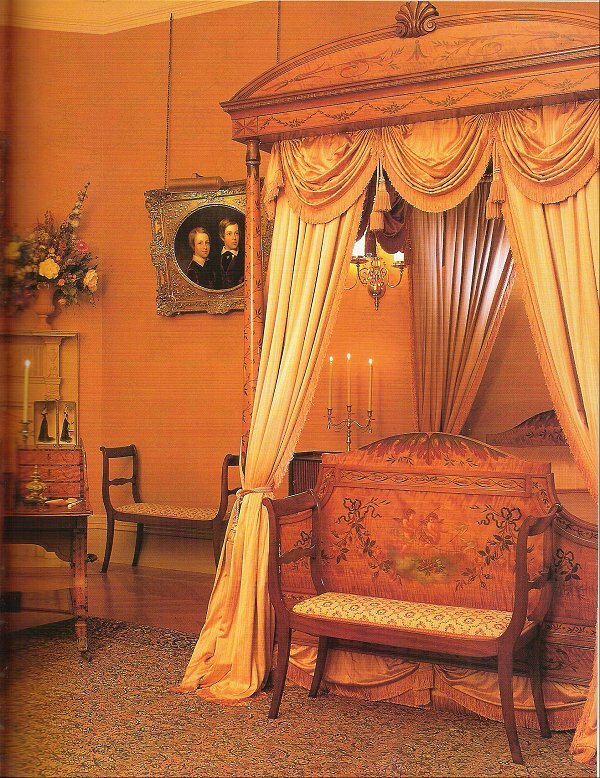 Just off of the ballroom is the South Tower Room which serves as Caroline’s boudoir. Part of the room includes Caroline’s Sitting Room. And yes, that is her harp, Madame Angelique, standing there next to the window. 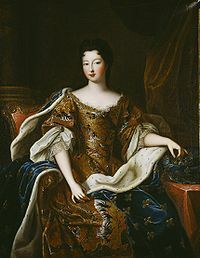 It had originally belonged to her grandmother,Comtesse de Rochefort,Jocelyn Ysabetta, the namesake of our youngest daughter. 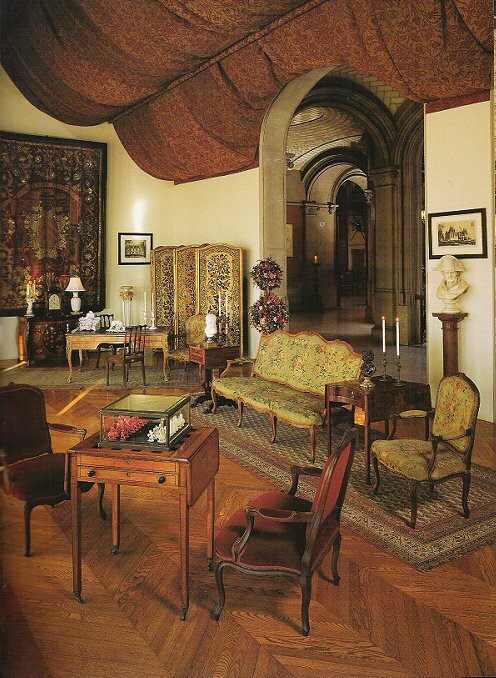 Next to it we have the Raphael Room, which of course is named after the works of mater artist, Raphael Sanzio who lived in the late fifteenth and early sixteenth centuries. The blues and golds of this room set off beautifully the 19th century furnishings of this room and gives it a cozy, intimate feel. 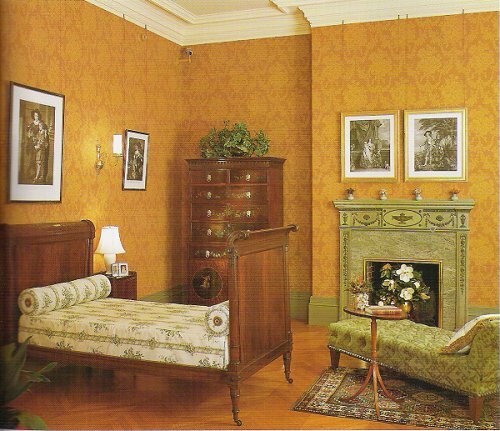 The Earlom Room was inspired by the work of English printmaker, Richard Earlom.The furnishings of this room are Dutch and date to the 18th century. 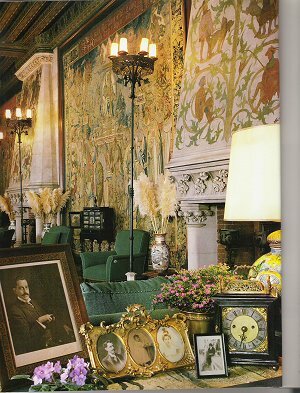 The wallpaper is silk and there are also a total of five Spanish Revival chairs in this room. The North Tower Room is the last of the four rooms that are interconnected. 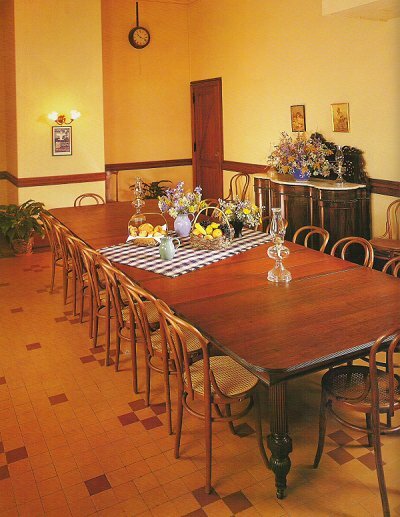 Usually we reserve these four rooms when we have heads of State and their families or a group of guests travelling together who come to stay with us here at the Château de Rochefort. 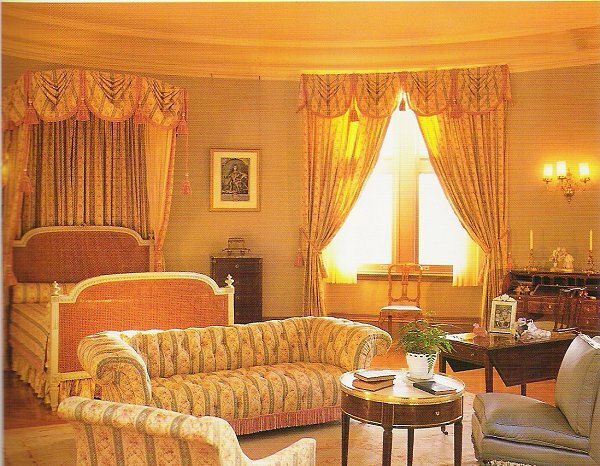 This room features 18th and 19h century furnishings that are set about the graceful oval curve of the room. 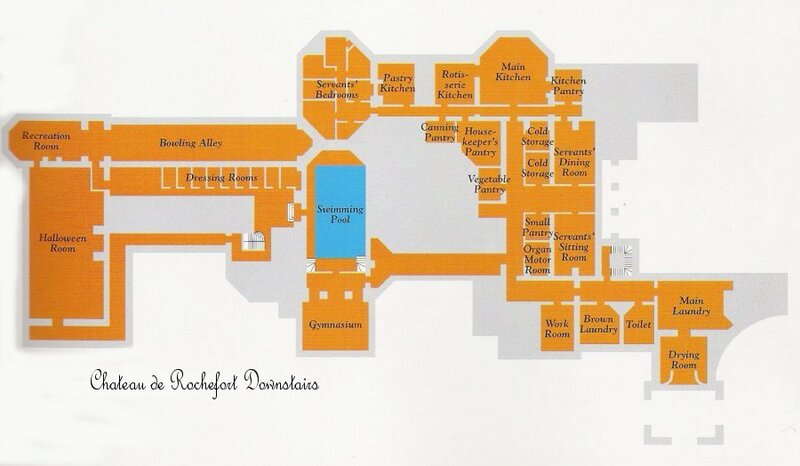 There are just a few other rooms on this floor we will look at that are on the other side of the Ballroom. 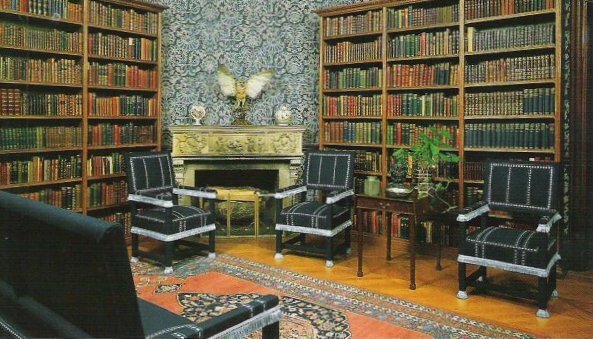 Here we have the first which is the Watson Room. 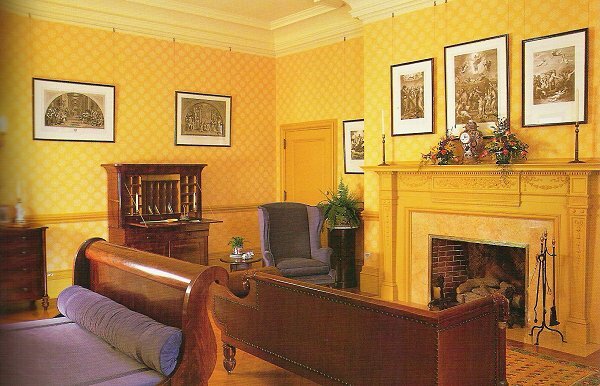 This room was named after English artist James Watson whose works are featured in the room. 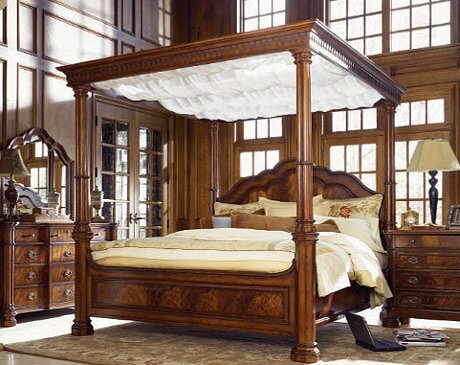 It is furnished with a set of twin beds made of mahogany and boxwood. This room is a favourite for many of our guests because it is simple and elegant. 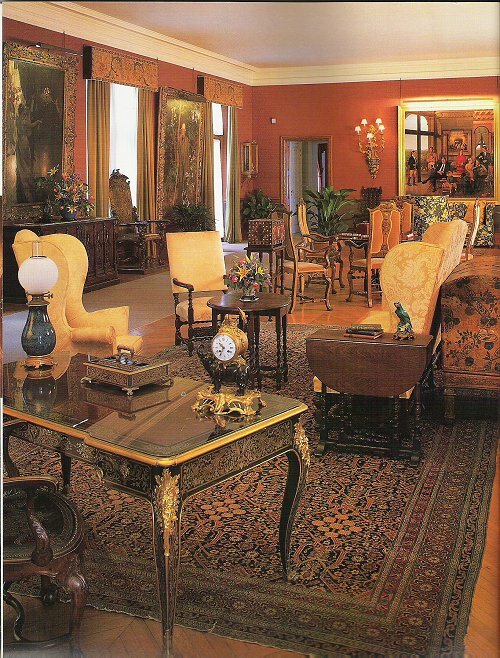 We have next to it Van Dyck Room which is named for the 17th Century Dutch painter, Anthony Van Dyck. We have prints of these famous paintings in this room rather than the originals. 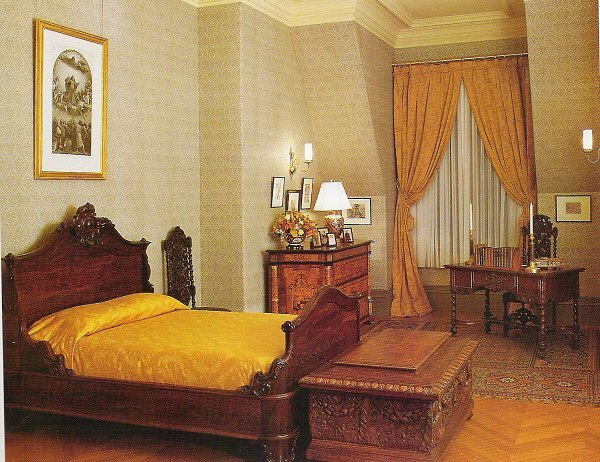 The walnut bed of this room is French Empire and dates back to the Courts of Napoleon. 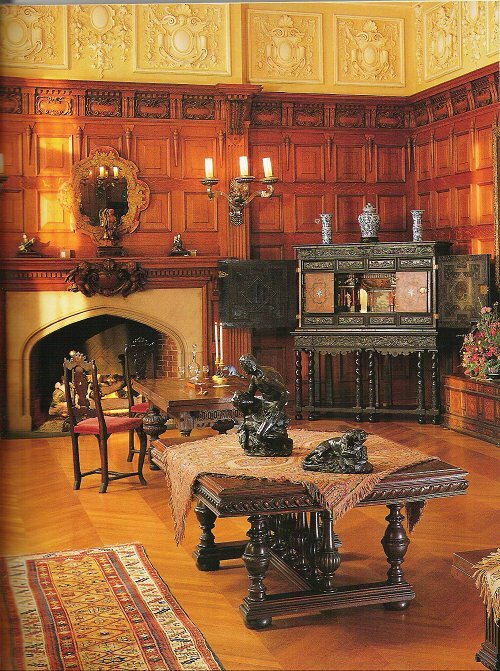 The Room’s trim, the fireplace mantel are carved by local artisans in the 17th century and are original to the house. 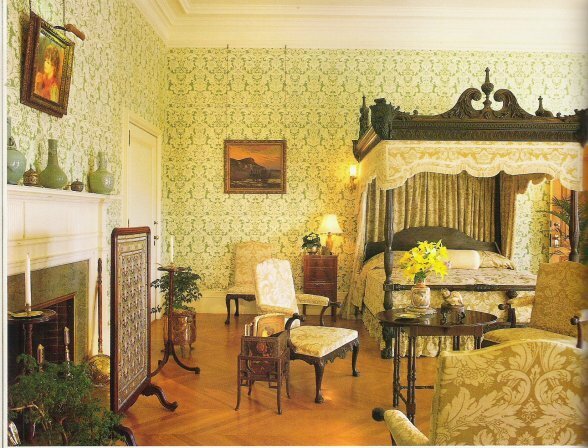 The Morland Roomfeatures Rococo Revival and is named for painter George Morland. 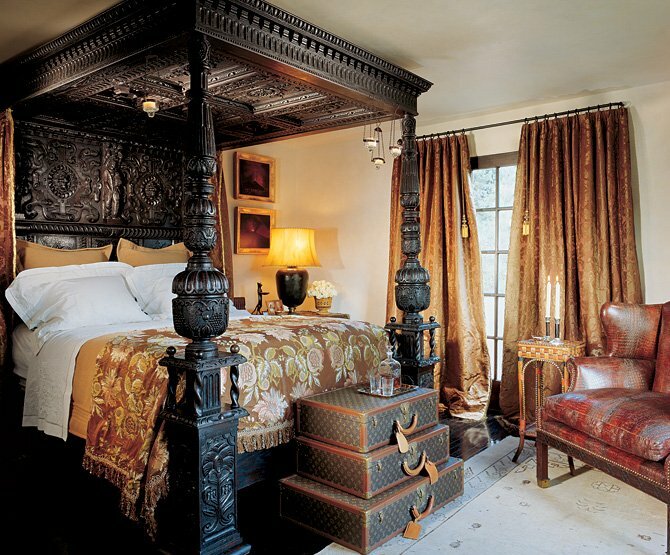 The canopied bed features a hand painted 19th century fabric is silk that comes from India. The room features a turquoise silk damask wall covering which lends itself to the exoticism of the Chinese and Indian antiques featured in this room. 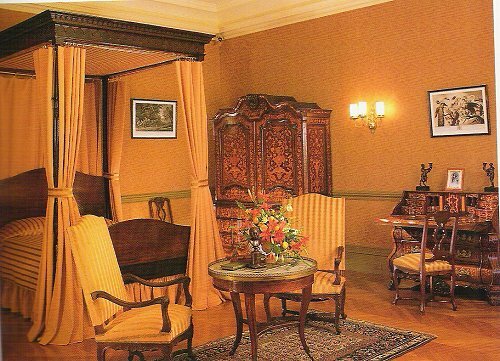 The Sheraton Room features the furnishings made by 18th century cabinet maker Thomas Sheraton. 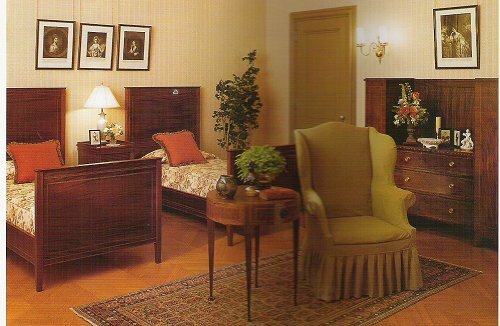 The bed, desk and complimentary chairs throughout the room are made of English satinwood and mahogany. The Madonna Room is usually reserved for those heads of State who are religious leaders or are more religiously inclined. The prints are lovely and the room has a very restful feel to it. Fortunately, our usual guests are presently travelling so we can take you for a rare tour of the fourth floor. At there request of Mr. Robert Grayson and his Security Chief, Andy McDonald, we are not including any architectural layouts of this level. I am sure you can understand. We will begin with the Fourth Floor Salon. 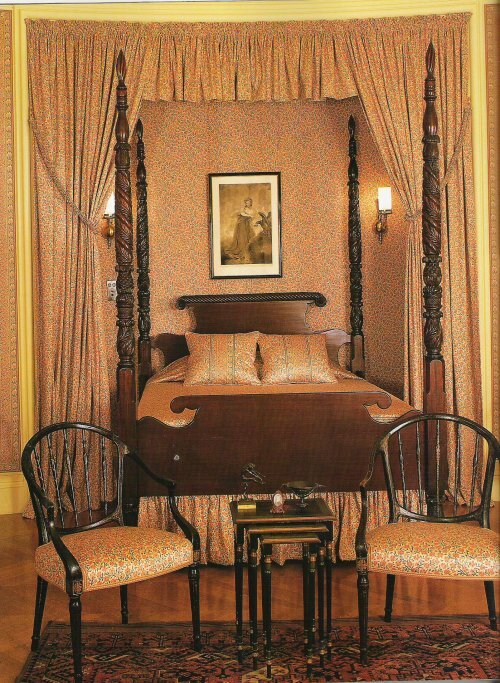 Mr. Grayon’s Guest Room which adjoins Miss Cody Jean Lane’s room. 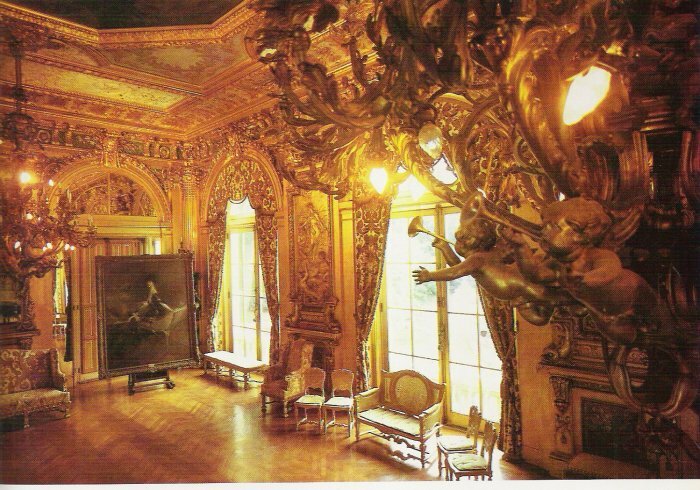 This particular room was decorated to Sebastien’s specifications with Ms. Lane in mind. Of course both they and their household entourage have full range of the house, but these rooms are specifically for their use. 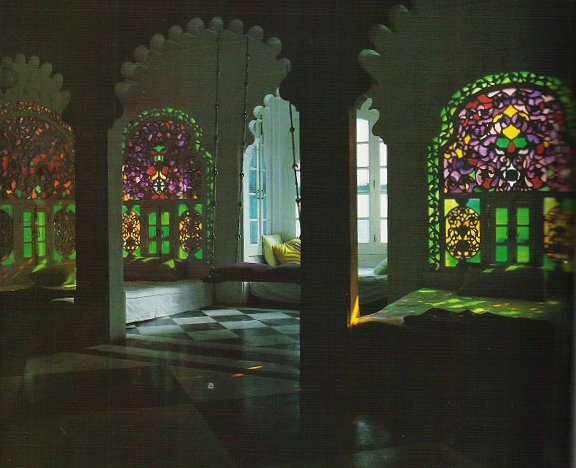 This last room on the fourth floor I will show you the Muhghal Room which boasts stained glass windows and elements imported directly from the remnants of the Bhaipur palace of Rhajahstan in India after it’s unfortunate destruction by earthquake more than twenty years ago. The stained glass, ironically is mostly original. Sometimes I refer to this one as the Attila Room because it reminds me of the time that Mr. Grayson and I spent in India and the East. 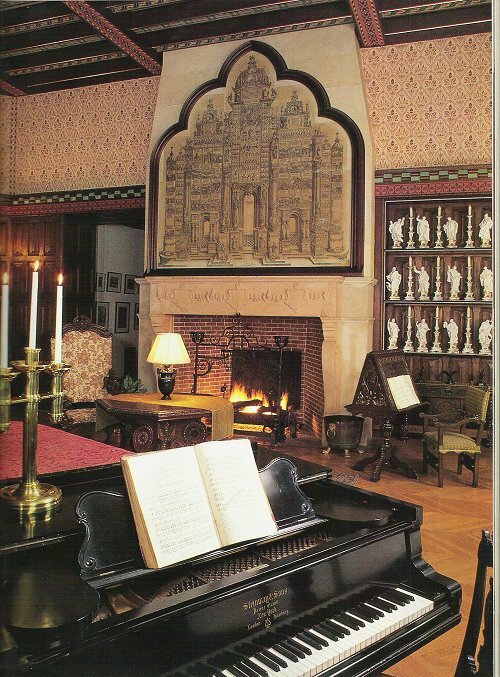 This particular room is quite often used by Mr. Grayson’s immediate family and guests while staying here at the Château de Rochefort. Now we are going to take an unusual view that most guests do not usually get to see of the Château. We are going to take the servant’s stairs all the way down to what is called the Downstairs. 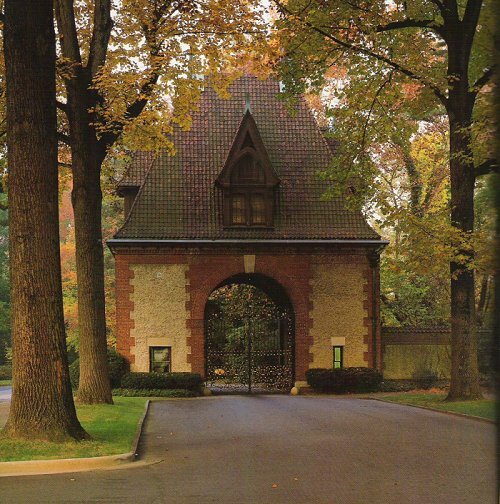 This area is home to between thirty and sixty staff members who are all residents of the village or here at the Château should they choose. 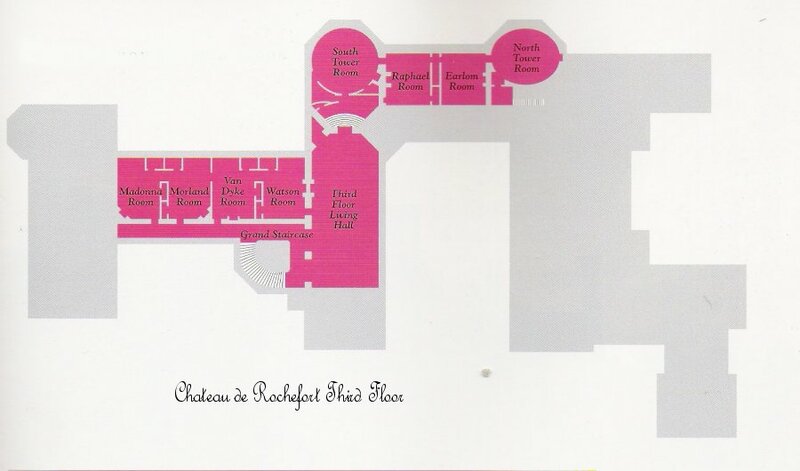 This level of the house also holds our kitchens and nearly all operations that keep the Château de Rochefort running smoothly. There are other recreational rooms located here as well. 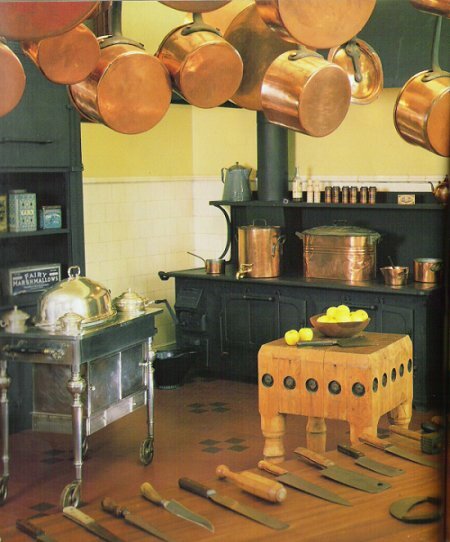 But let us begin with the Main Kitchens. 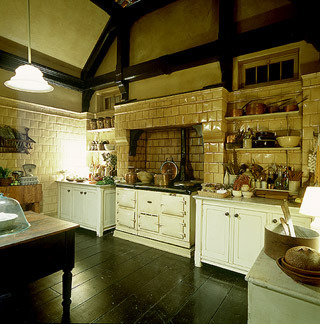 These older stoves are still in use for large gatherings. But mostly we prefer to use a smaller stove in the pastry kitchen. If you follow me we can take a look at the Servant’s Dining Hall. Of course, everyone is on a different schedule and are served in shifts, so rarely is there not something to eat or someone being served here. 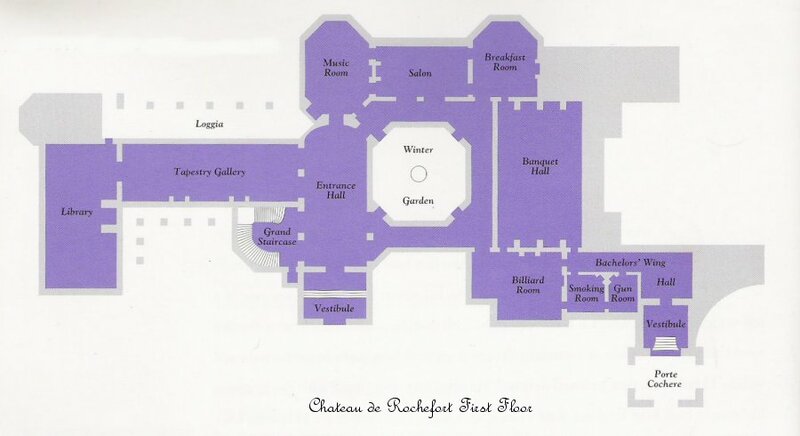 It is a strict Château de Rochefort policy that we never let anyone go hungry here . Family, guest or servant or stranger, we take great pride in taking care of those who would come to us. We have larders, walk in refrigeration and freezer units. 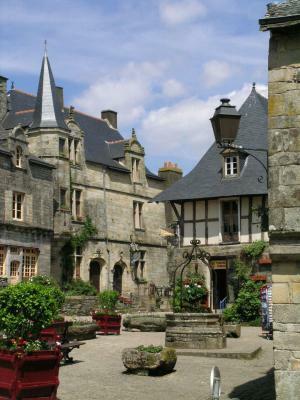 The Château de Rochefort and the surrounding lands and village are its own economy and are self-sustaining. 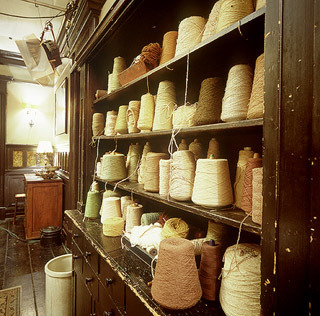 One of the other rooms that is frequented by many in the house, especially Amarante is the Weaving Room. The spindles you see here all come from sheep that are raised here, the wool is gathered, spun and dyed here as well. 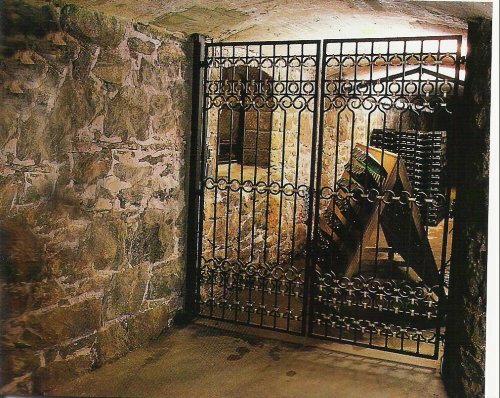 Again, this adds to the self-sufficiency of the Château. 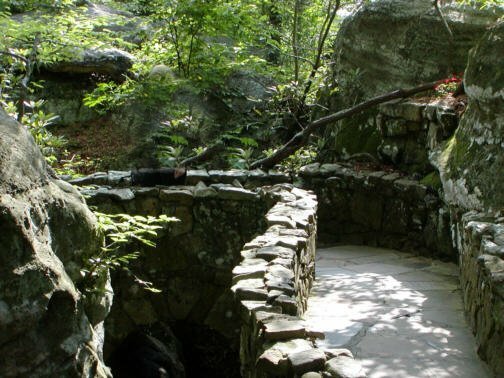 Now let us take a look at some of the recreation areas. Here we have the swimming pool The water is heated and is used year round. 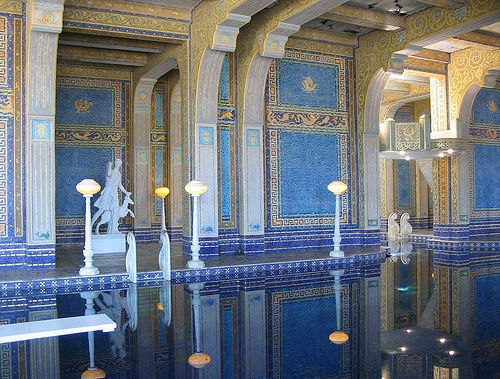 It was modelled after the Roman Baths of Caracalla. Of course, this one is more modestly sized.There is also a gymnasium, a bowling alley and rec rooms. The Samhain or Halloween Room is another room that is presently closed as we are preparing for our Annual Celebrations. 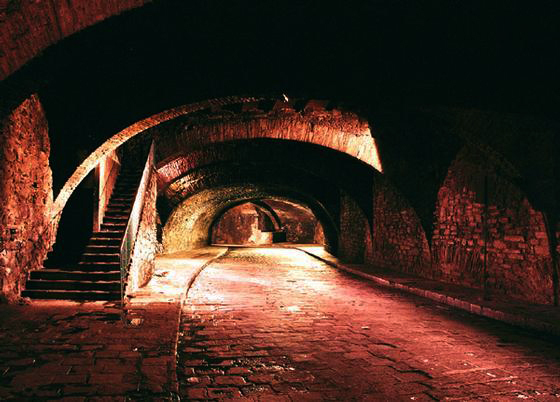 Beneath the house are a large network of caves, family crypts, secret chambers,wine cellars and champagne rooms. 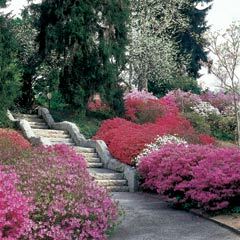 We can go back up and out this way through the woodland trail and down the azalea steps that lead to the Château Gardens. Just past the extensive tulip gardens you can see the Conservatory which serves as the main greenhouse. Gardens are just as important here as the rest of the house and we have an entire staff of full time, professional gardeners, vintners and groundskeepers. If we go back to the more Northern end of the Château, we come to the Stableyards where we keep the horses and carriages. We will show those at a later time. Even further back into the forest are the mews where Sebastien keeps his falcons so that they are undisturbed by the sounds of the stables and the main house. I do hope that you have enjoyed your tour of our home. Please be sure to come visit us again. Au Revoir! 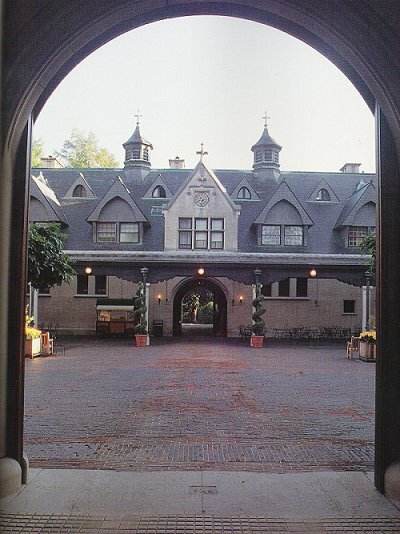 OOC Note: The photos throughout this post are mostly photographs that I have collected over the years of the Biltmore Estate in Ashland, NC. 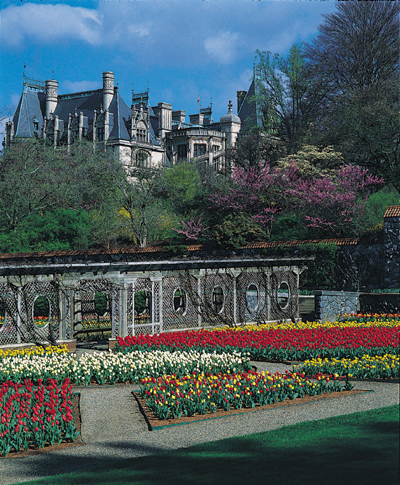 The Biltmore Estate was constructed by George Washington Vanderbilt III, who had been inspired by a photograph of the Château de Blois in the Loire Valley in France. 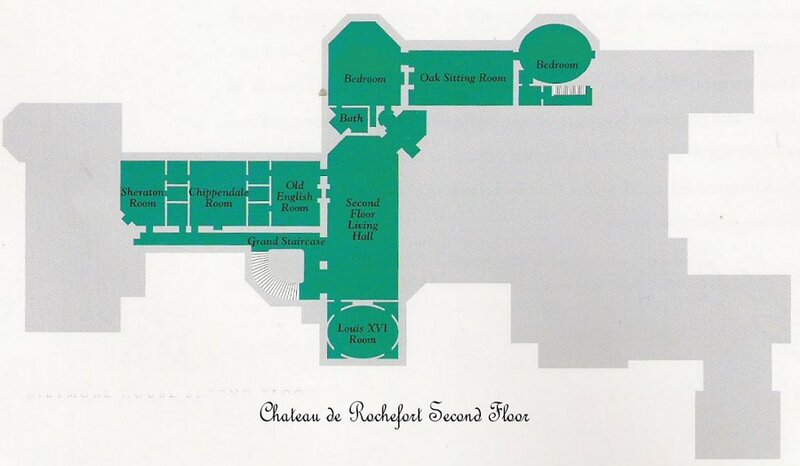 There are other rooms in the Château de Rochefort that are certainly not in Biltmore. This is because Faelyn and Sebastien have different tastes. 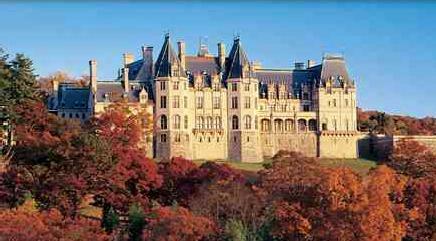 In the interests of sticking with the floorplans of Biltmore, the names of the rooms are relatively the same. Some rooms, of course are not shown. As well as I know your home, it’s always nice to get the personal grand tour. *smirk* I’m looking forward to the next time we visit, as always. Oh, and as to your comments on the Smoking Room, I for one am glad Sebastien has kept its function. And we have toured it a thousand times, you and I. Remember the first time that Sebastien showed it to you? It has changed a bit over time, and yet….not. I am in full agreement with Sebastien about not changing the name or the function of the Smoking Room. Even I indulge on occassion. Just because human proclivities seem to have a bit of a backlash against it, does not mean that we have to. And although we women are always welcome in that wing of the House, you and Sebastien, Marius and everyone seem to make the most use of it. There is something quite reassuring to me in knowing that the men of the House are nearby and quite contented enjoying their cigars and cognac. Ah, Madame de Rochefort, a truly herculean undertaking you have completed! I am at turns awed, and amazed at your organizational skills. Thank you, mon amour. *gives him an appreciative smile* It is with great pride that I have been Mistress of Monsieur’s ancestral home all of these centuries. You have Hsu to thank for keeping much of your inheritance intact. *mock surprise* Really? I had not noticed, Sebastien. Perhaps it is nothing more than the ghosts of those Mughal and Hindi Rajkhumaris that are singing in the room that was once a part of their Zenana (harem) at the Mahal it came from. Or perhaps it is the ghosts of your own ancestors. Your sister and mother both used to sing, did they not?